Holiday Cottages in Cornwall: Properties on our favourites shortlist! Properties on our favourites shortlist! Jenna: "If I had a big celebration I'd rent Samphire House, near Crackington Haven when the pool was heated between June and the end of August. I think this would be a fab place to rent for a group of friends and family. Jo: "For a coastal property I would choose New Quay Lodge, in Flushing. The decor has a nautical feel, while remaining in keeping with the style of the house, which works well and I love. It is a reverse level property which gives it incredible views across to Falmouth, with a beautiful terraced garden to the rear." Caroline: "Purely for its quirkiness and stunning location, I do love The Boathouse in St Mawes. You can't get closer to the water in Cornwall." Lucy: "Downholm in St Mawes for the pure luxury and location. It's right on the water, yards from the beach, and a few minutes walk from the centre of the village. The interior is wonderfully presented and there is a large garden overlooking the water. Just perfect." Richard: "You can't beat Wild Acres Cottage, on The Lizard for the views (Jo agrees). The location is simply stunning. An incredibly remote, quiet property which has been filled with everything you need for your holiday by the sea. Spare pair of wellies, or a bucket and spade! 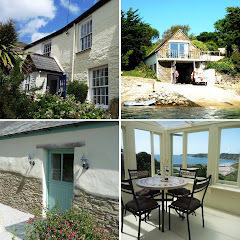 If you're looking for a great traditional holiday cottage for the family then Brigids Patch in St Mawes has it all. A large garden, great sea views and ground-floor accommodation for the aged relatives." To view any of the above mentioned cottages just click on their names to be directed straight to the property, or do feel free to visit our website to browse around for your own personal favourite.